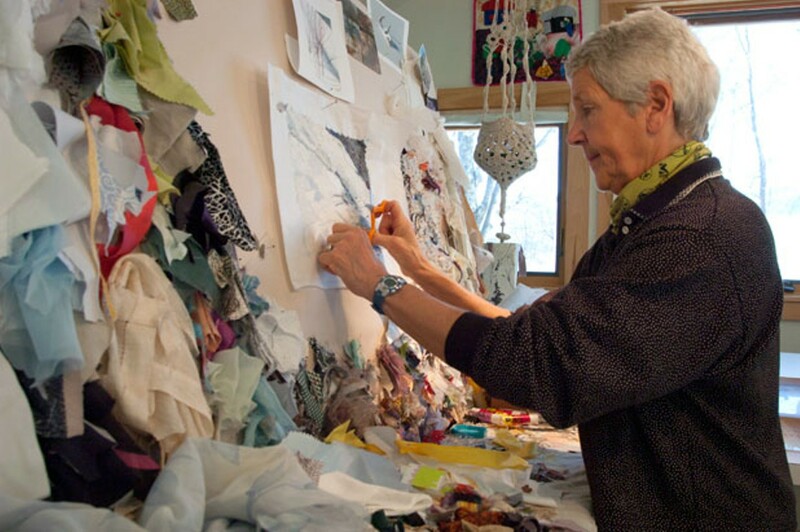 The hundreds of fabric shreds pinned to Dianne Shullenberger’s fiber-collage workstation look like mounted butterflies: Each specimen is a different color and texture; some satiny, some rough and some with delicate edges that curl around the pin like wings. 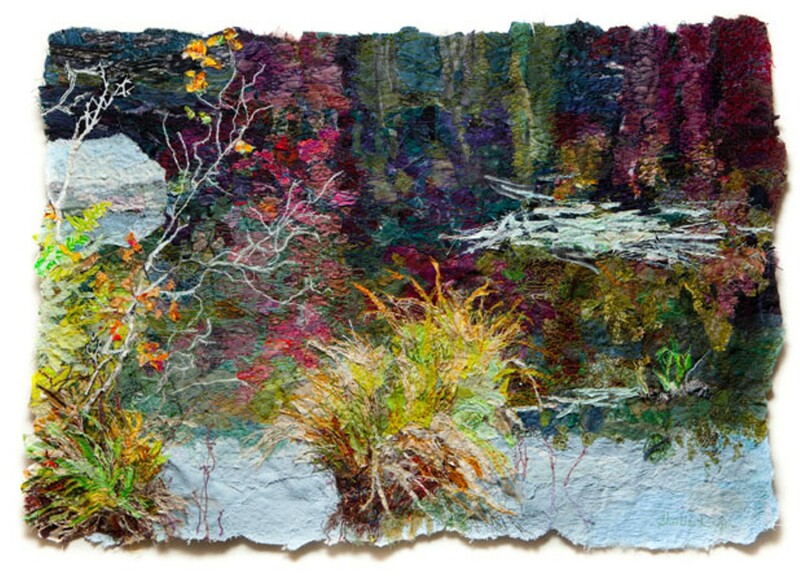 Shullenberger, 67, uses those scraps to create landscape-inspired collages so intricate, they could almost pass as watercolor paintings. The trick, she says, is in the layering. She begins with large blocks of color and builds them up until she has perfectly captured the sheen on a bog, or a stand of papery birches. All of Shullenberger’s work — including colored-pencil drawings — is a response to nature. “I spend a portion of every day outside,” she says and adds, “I love sports.” In fact, she was a physical education teacher before moving to Vermont in the late ’70s. Shullenberger skis, hikes, bikes and kayaks, and always brings a camera to capture images for use in her art. Shullenberger’s gallery and studio are attached to her Jericho home, which, she discovered after moving in, once belonged to Wilson “Snowflake” Bentley (1865-1931), the pioneering snowflake photographer. During a renovation project two decades ago, Shullenberger uncovered items he had used in developing his photos. The works on her gallery walls are odes to Shullenberger’s favorite places, such as a trail on Camel’s Hump and a stream in West Bolton. One colored-pencil drawing depicts the silver shimmer of an early-morning, early-fall frost on a Mount Mansfield trail. “People who don’t hike would never see this,” she notes. Michigan also figures in Shullenberger’s work — she spends summers at her husband’s family cottage on Lake Michigan. The artist is mesmerized by the sand dunes there; she recreates them, along with wildflowers, bogs and swamps, in her collages. Shullenberger has always sewn. She grew up in a Midwestern house full of fabric and sewing notions, and her mother made all of her clothes. “I assumed everyone’s mom made their clothes,” she reflects. By the time she moved with her husband and two kids to Jericho in 1978, she had committed to pursuing fabric collage. At her studio, Shullenberger pulls out some examples of her early collage work. At first, she’d often make tree boughs from big swaths of a single fabric cut to a desired shape. Gradually, she began working with much smaller scraps, layering them over one another to arrive at just the right line and form. This means she goes through boatloads of fabric. Shullenberger visits fabric stores everywhere she goes. “I’ll buy it without even having a project in mind,” she says. Friends and acquaintances are constantly sending her old ties, slips and handkerchiefs to incorporate in her work. Shullenberger has a special place in her heart for sheer materials, the magic of which is showcased in a recent collage called “Evening Fog.” She used layers and layers of sheer scraps to create a thick, visceral mist rising off sunset-tinted water. But it’s not just the fabric scraps that give Shullenberger’s collages their depth. “The thread is almost as important as the fabric,” she says. A drawer at her workstation brims with spools of every color. Some threads are nubby, while others are satiny smooth. Shullenberger uses them to make subtle color changes, but also to “draw,” say, tufts of fine grasses or debris along a river’s edge. Shullenberger’s work is part of “Winter Show” at the Furchgott Sourdiffe Gallery in Shelburne, through January 21.